Another birthday at work brought about the opportunity to try something new. I’m also in the process of moving and so I’m trying to use up as many ingredients in my pantry as possible. 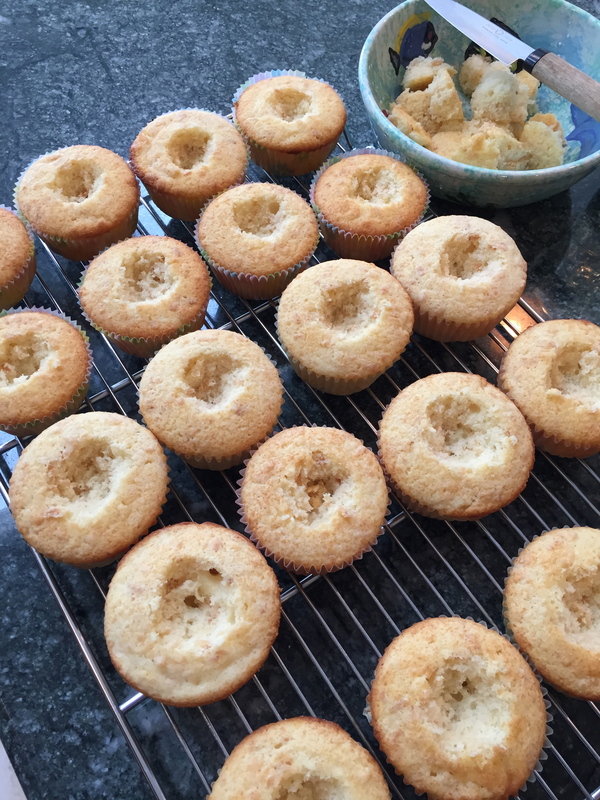 I stumbled across a cupcake recipe that incorporates both coconut and cake flour, and since I had both I figured this would be perfect. The cupcakes came out quite well. I may have read the recipe wrong and used toasted coconut in the batter instead of untoasted but I think it actually turned out quite well with the toasted coconut in there. Unfortunately my tool designated specifically for cutting the centers out of cupcakes had already been packed, and so a paring knife was my next best bet. I also had some reserve egg yolks, so I whipped up a batch of fresh lemon curd the night before. 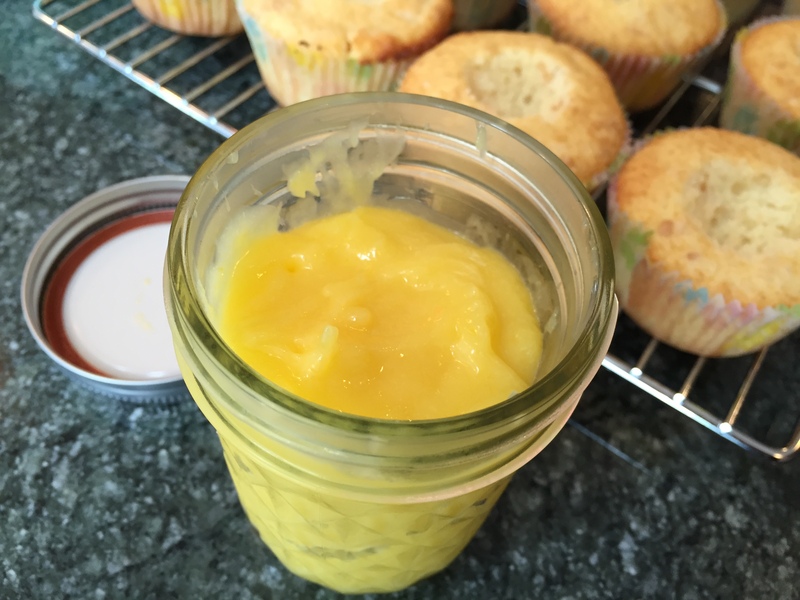 I absolutely love lemon curd! Although it must be just right – the perfect amount of tang and definitely not too sweet. This one was perfect, and it was all I could do not to slather it on the cupcake centers I had cut and just eat the whole lot. Into the centers went the lemon curd! I love cupcakes with a surprise center. They add something cute, and sometimes clever as well. 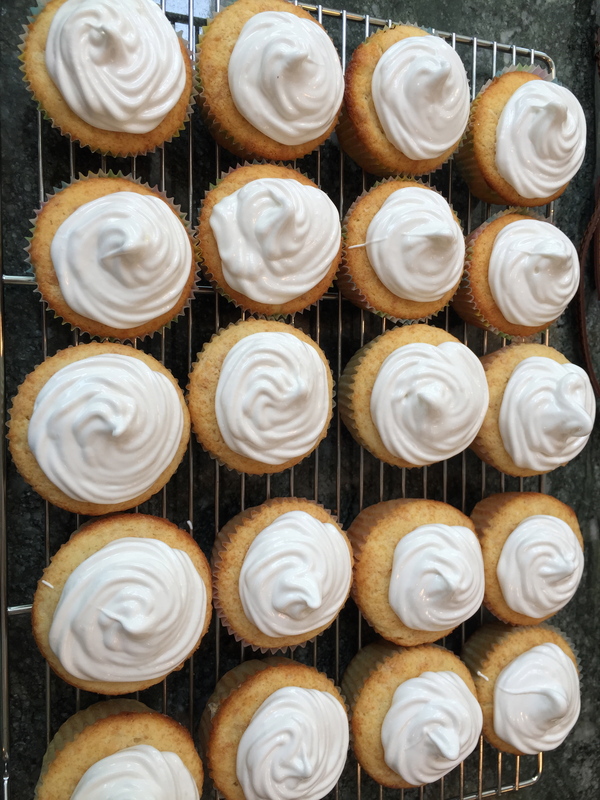 As for the topping, I was thinking of making some kind of meringue topping as the cupcakes were turning into a cross between coconut cream pie and lemon meringue pie. I had some leftover meringue powder, so I thought it would be perfect to use that up for the frosting. HOWEVER, the meringue topping that came from the powder was TERRIBLE. It tasted so artificial and just plain gross. I had to scrap the whole batch and revert to my go-to marshmallow frosting. Next came the decision of whether to toast the topping. Doing it by hand would just have been entirely unreasonable and a serious time commitment. I decided to give the broiler a try, and I was so thrilled when they actually came out lightly toasted! 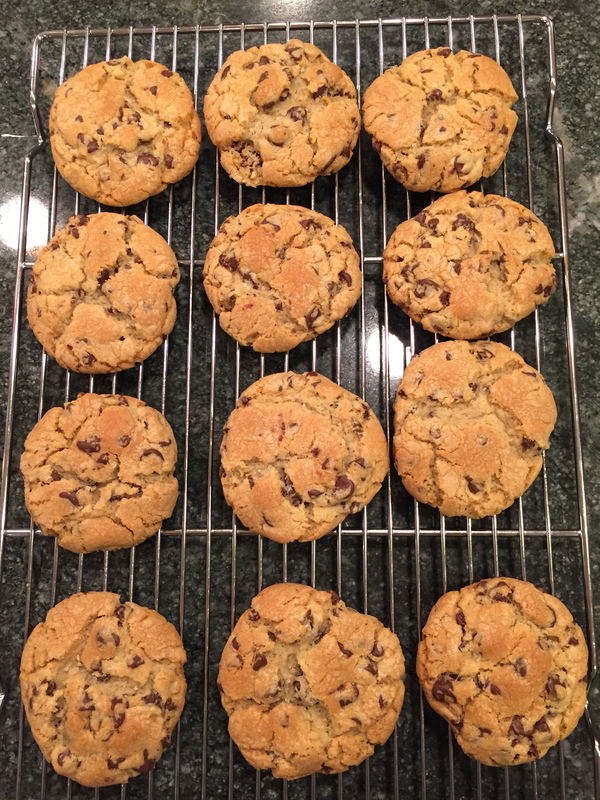 I added a few sprinkles of leftover toasted coconut, then dug in. There is definitely something special about cake flour. It creates a light and airy cake, and this one with the specks of toasted coconut mixed in was a real treat. 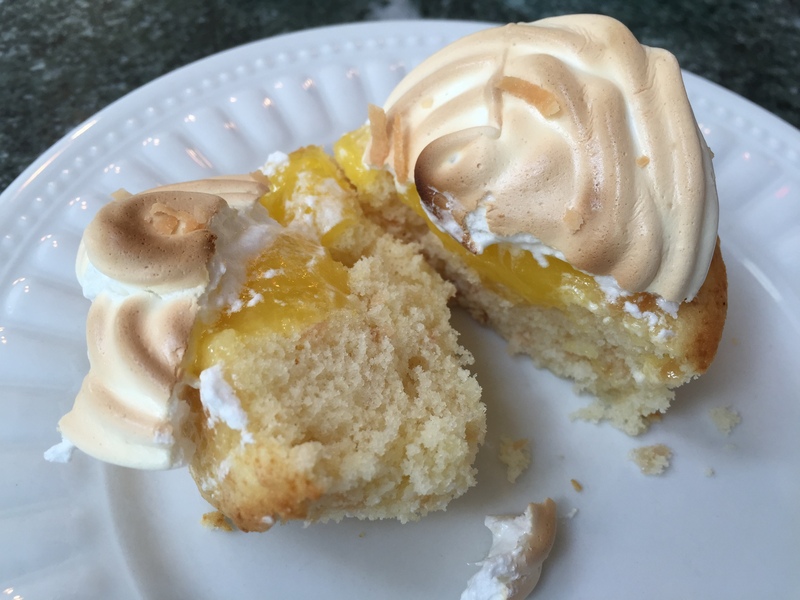 The tangy lemon curd added a great contrast to the sweetness of the cake and topping, and the topping itself also added a unique texture factor, especially with the light toasting. The best part was that these were a huge success at work! 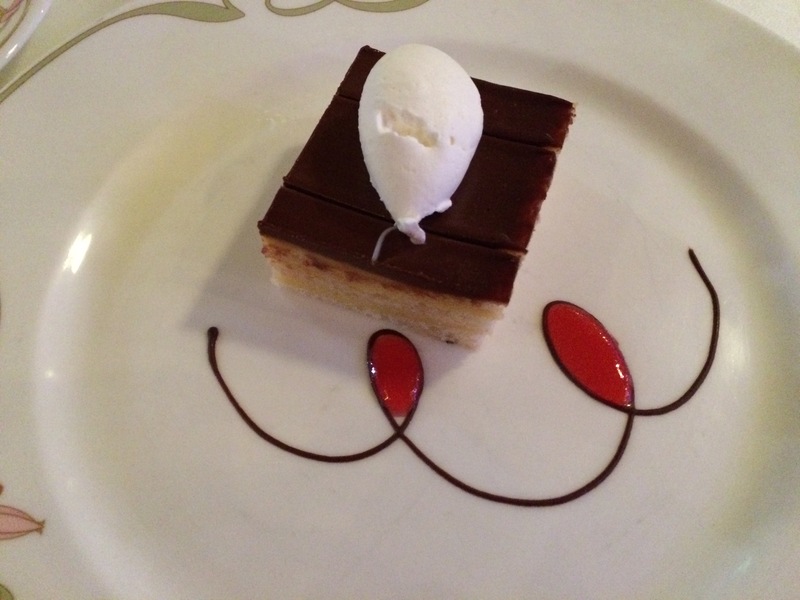 Somewhat embarrassingly, I must admit that we went on the Disney Cruise two months ago and we still have not blogged about all the amazing food we ate. And believe me when I say I’m not sure I was ever really hungry for seven whole days. Perhaps it was on the verge of gluttony, but you really can’t help it when everything is just SO GOOD. 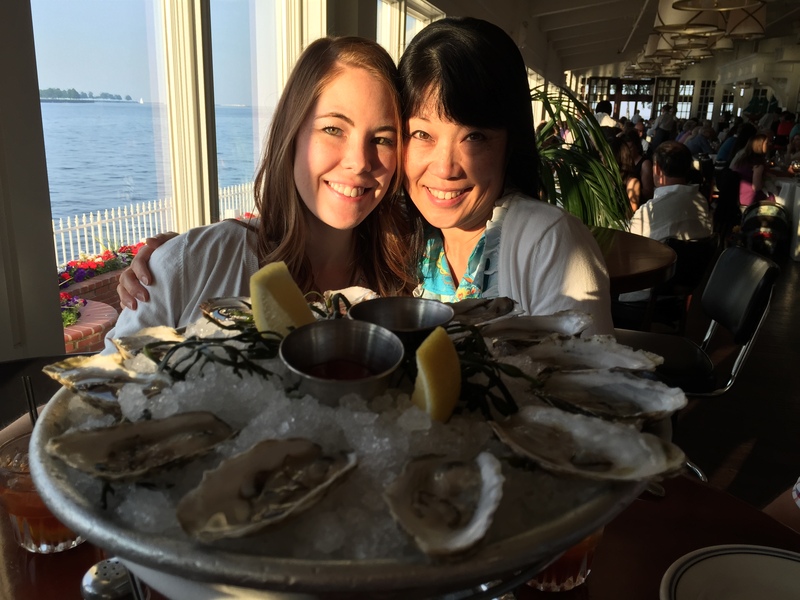 At first I was going to blog about ALL the food we ate at every meal, but I decided 1) that would be excessive, and 2) I don’t have quite THAT much free time on my hands. As such, I will feature only my favorites from our wonderful 7-Night cruise on the Disney Fantasy. 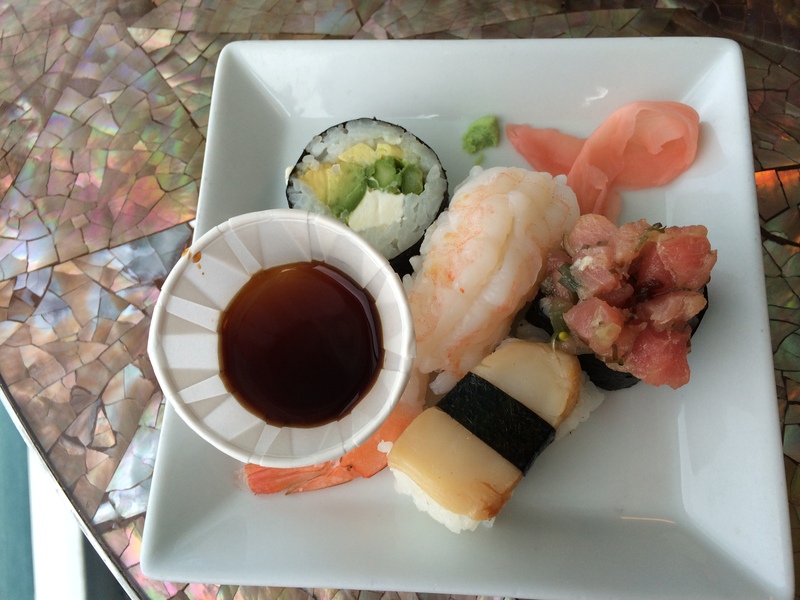 One of my absolute favorite places to eat on the ship was Cabanas. Not everyone shared my extreme enthusiasm for this eatery, which I suppose is understandable because it was usually more crowded as it was buffet style dining. When you first board the ship on Embarkment Day, Cabanas is the only eatery that is open until dinner, so everyone ends up there. The lunch spread was phenomenal – literally anything you wanted was there (sandwiches, burgers, entree style dishes, salads, fruit, shellfish, pasta, pizza, dessert, and on and on). I wanted a bit of everything, so I tried to grab a few bits of all the dishes that looked enticing. 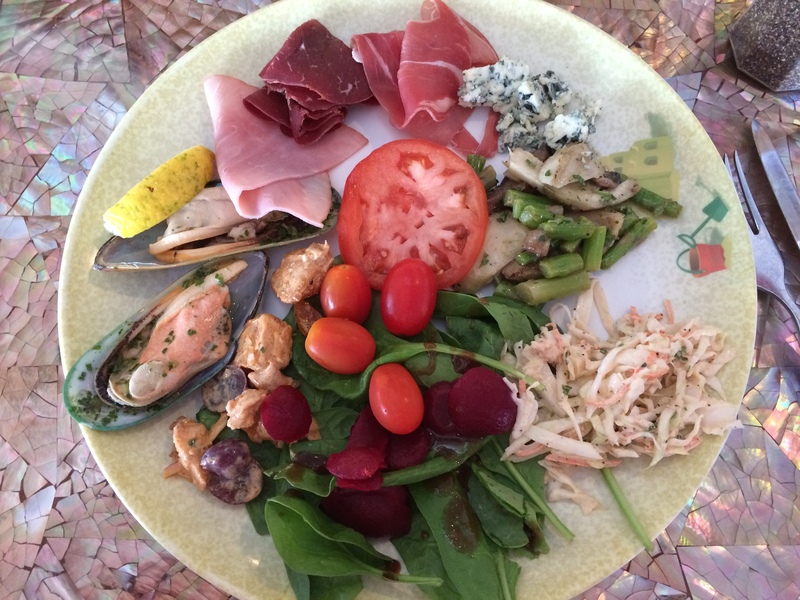 I selected three types of cured meet, a hunk of blue cheese (which was AMAZING), a cold asparagus mushroom salad, a crab coleslaw, spinach for salad with beets and cherry tomatoes, curried chicken and grape salad, and two huge fresh mussels. 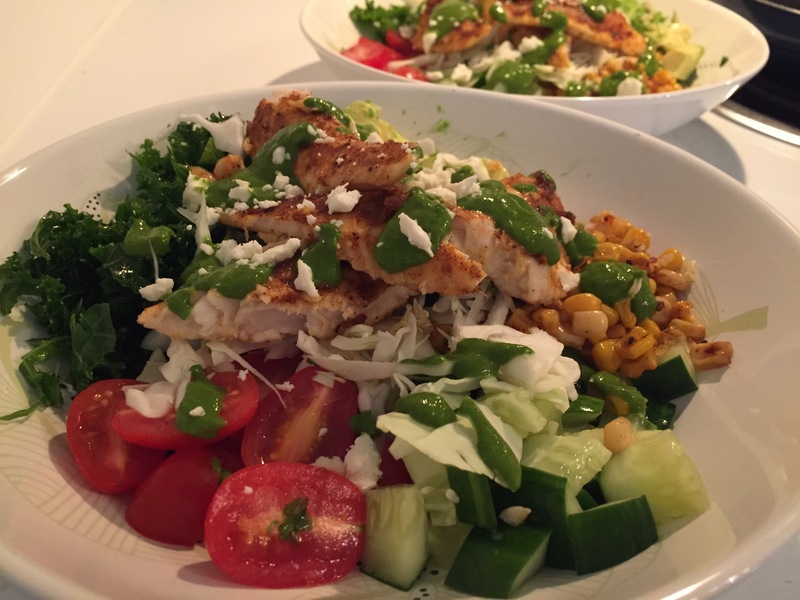 Everything was so fresh and tasted delicious! I also noticed overall on this cruise that the kitchen definitely reduced the salt and sugar content on all the dishes. I didn’t mind at all, everything still tasted great! For dessert we shared a carrot cake square. Now, we are big carrot cake fans, especially my dad, but what we are not fans of is “carrot cake” that is essentially all frosting. As good as cream cheese frosting is, it tends to be too sweet at most places anyway. 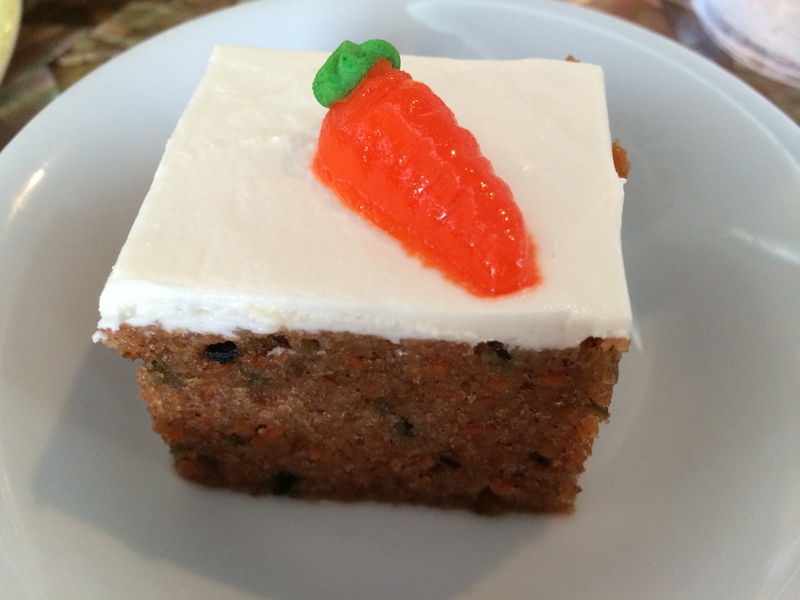 This carrot cake, however, was perfect. Not only was there just the right amount of frosting to lightly sweeten the cake, but the cake itself was deliciously moist with a great amount of spice and texture. A+ Disney. 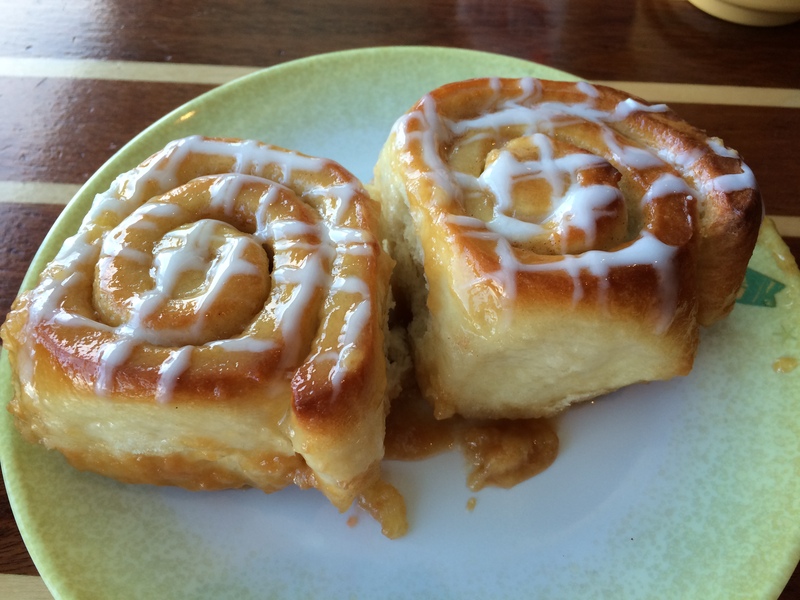 So possibly my biggest reason for loving Cabanas so much was breakfast. Yes, you could have anything you could imagine – think scrambled eggs, fried eggs, eggs benedict, omelets, waffles, pancakes, french toast, cured meat, cereal, pastries, etc. – but I soon found my favorite spot: the fruit and nut bar! I LOVE dried fruit and nuts together, but usually they are so expensive at home. Here, I could have a whole assortment without having to buy each individual kind! 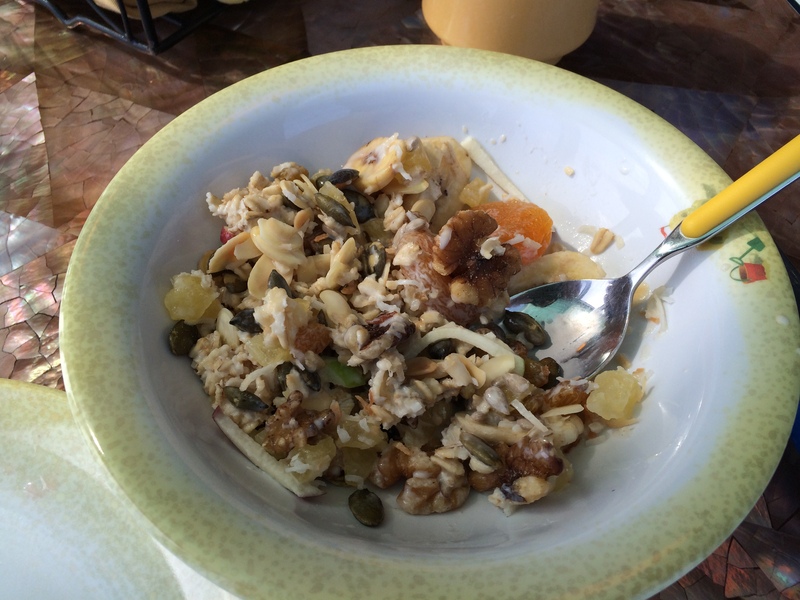 I would fill my bowl with walnuts, almonds, pepitas, dried apricots, dried bananas, dried pineapple, raisins, and toasted coconut, then I would pour over a ladle of bircher muesli (a yogurty-oat mixture with sliced apples). OMG I was in love! Okay, so despite my love for my tropical granola style breakfast bowl, I couldn’t forgo the warm tray of freshly baked cinnamon rolls! 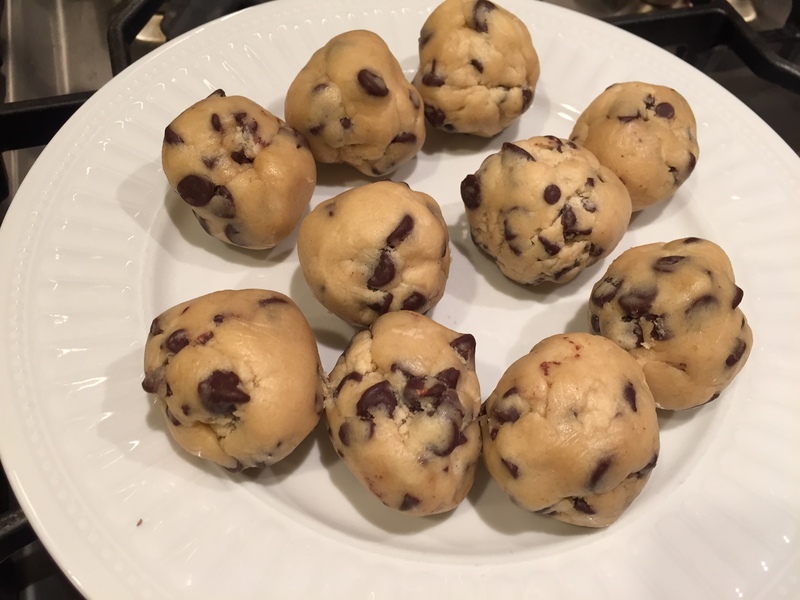 Gah, look how soft and gooey they look!!! And again, just sweetened enough with a light drizzle of frosting instead of slathered with entirely too much sugar. 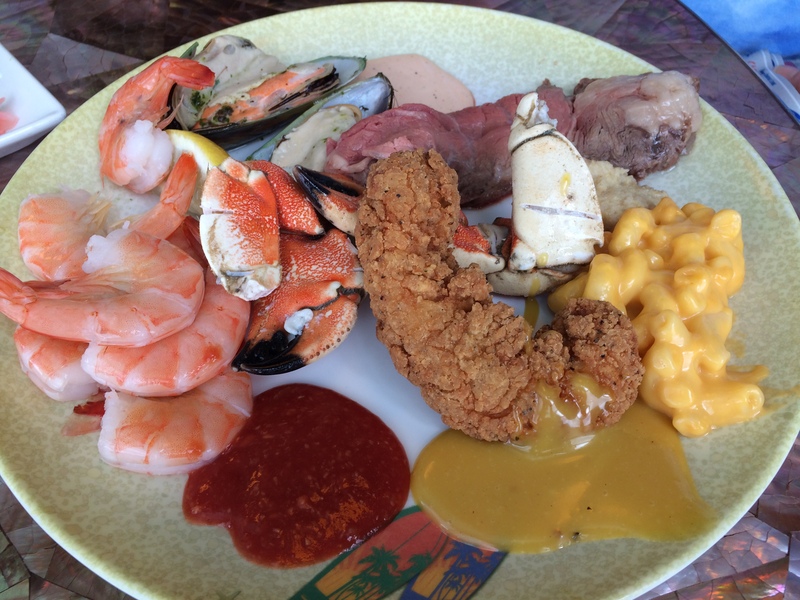 Just in case you were still curious about some of the other lunch buffet options, here was a plate on another day, which included shrimp, crab claws, more mussels, prime rib, a chicken tender, and Disney’s perfect mac ‘n’ cheese. Did I mention they also had plates of sushi?!?!?!!!!!! Surprisingly, I think my favorite was actually the asparagus-avocado roll. So in conclusion, Cabanas definitely wowed me, and I was always happy to overlook the screaming (and sometimes crying) small children because I could count on an entirely satisfying meal. Two months ago (so sad it’s been that long) our family began a seven night cruise on the Disney Fantasy. We felt extremely fortunate to be able to take a week to just relax in the Caribbean, enjoy each other’s company, and of course eat delicious food. As always, we were extremely pleased with the high quality of the food served, not only in what was actually being served but also the quality of ingredients, creativity in presentation, and diversity of choices. The first night we were seated at the Enchanted Garden. DCL features a rotational dining system, so each family is assigned two servers who travel with you to each of the three main restaurants throughout the cruise. This also gives guests a chance to visit all of the restaurants, and it never gets boring because the menu changes every night, with some special theme nights as well. 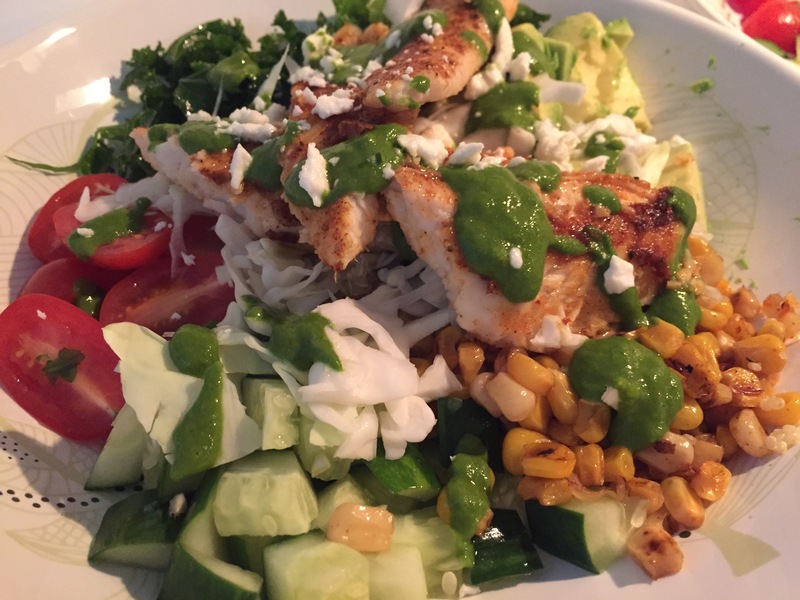 There are four categories to choose from for each dinner – appetizer, soup or salad, entree, and dessert. Yes, you get all of those, plus bread, plus more of anything you ask for. It’s intense, to say the least. For her appetizer, Christine ordered the ahi tuna avocado tartare. 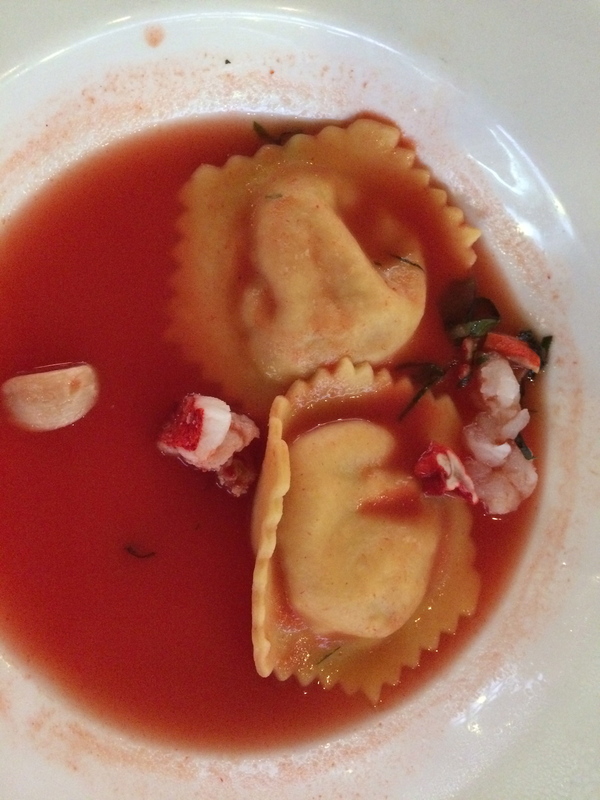 I ordered the lobster ravioli. Although it may seem small with just two ravioli in a tomato broth, I really appreciated how each course was portioned just right so that you didn’t get full after your appetizer and salad. The lobster meat was delicious – juicy and sweet, and not tough. The lobster filling was also lovely, with some sherry flavoring I believe. Also, the tomato broth was extremely light, but at the same time very flavorful and it actually tasted like real tomatoes. 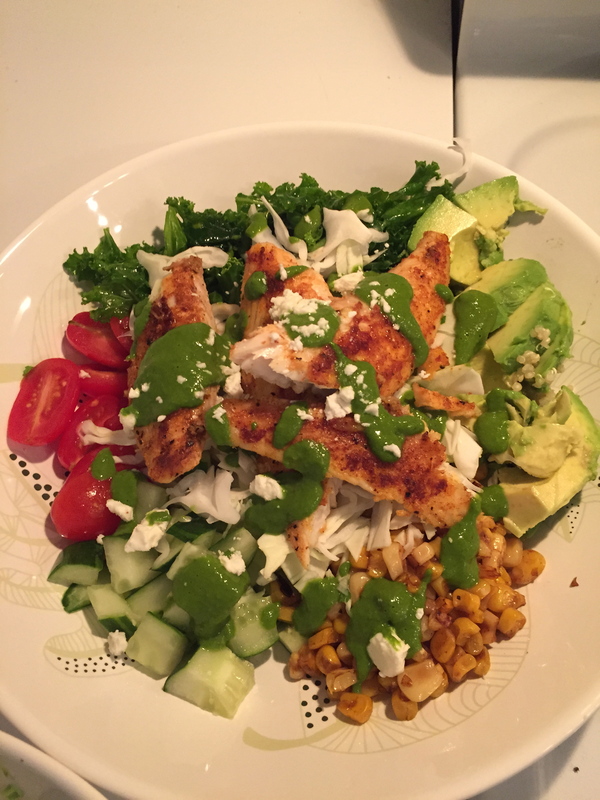 Apparently, I forgot to take a salad picture this night. For her entree, Christine ordered . . . .
For myself, I ordered the seared sea scallops with asparagus and couscous. 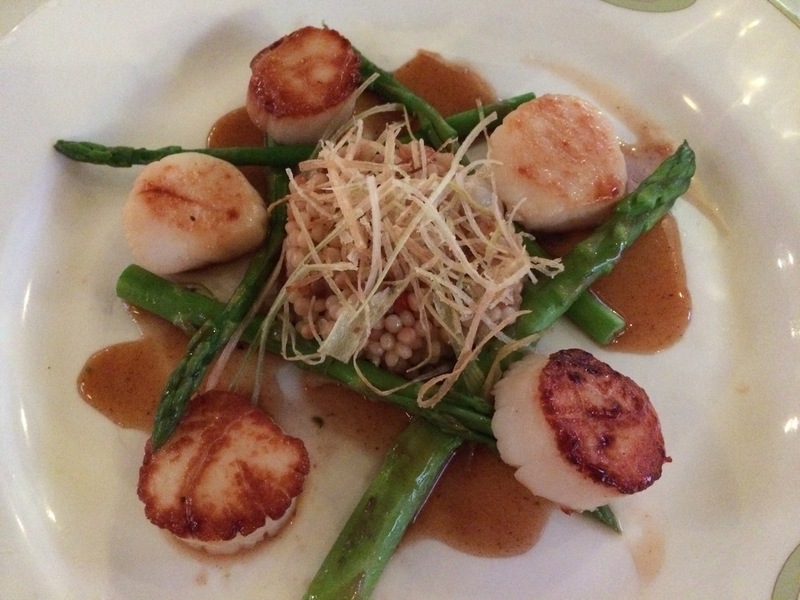 The scallops were beautiful, with a nice seared top and soft interior. 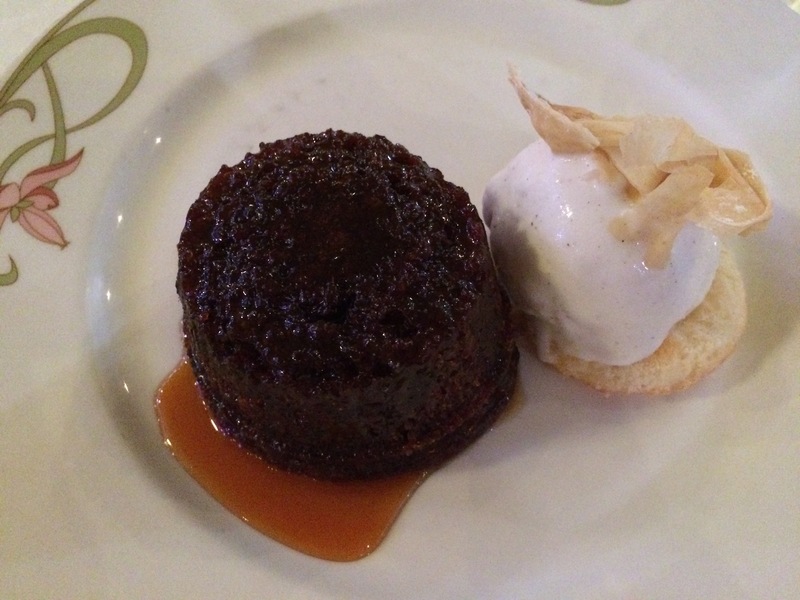 I ordered the sticky date pudding, which our server Fredi recommended. 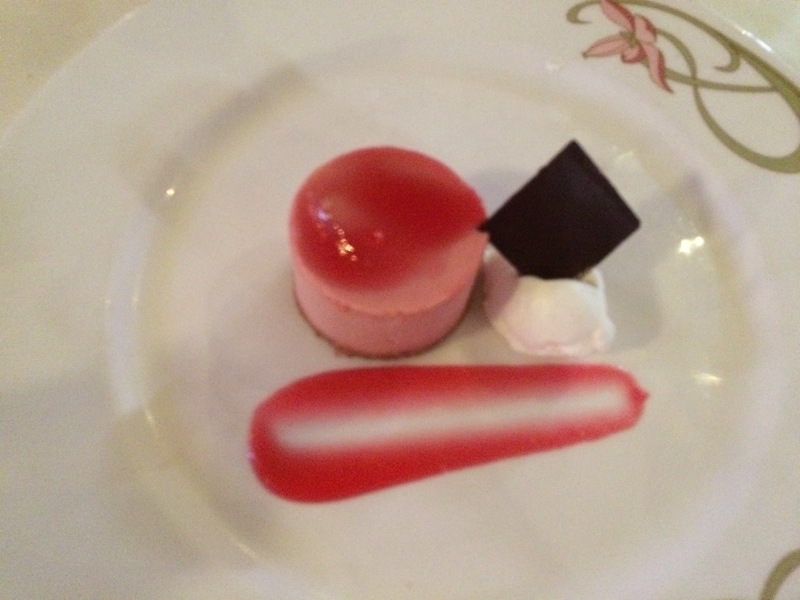 Normally I probably would not have picked this, but it actually ended up being one of the best desserts of the night. 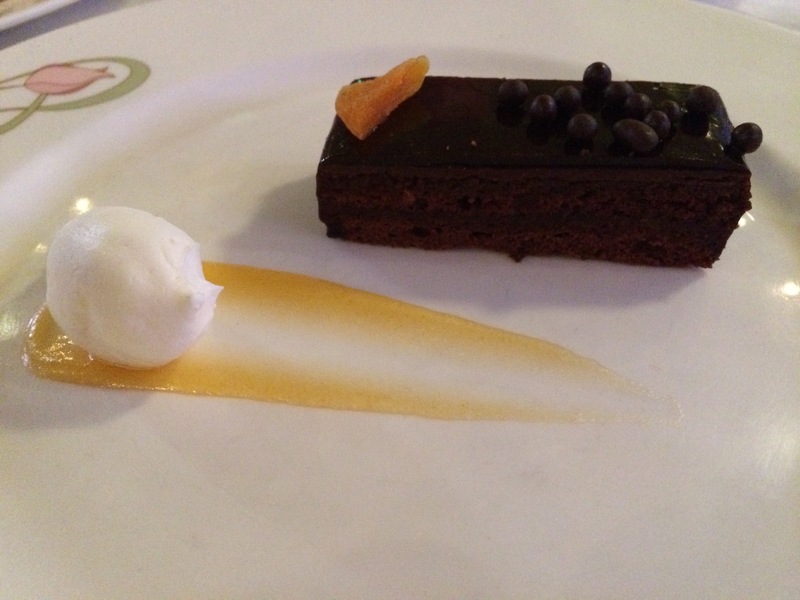 Dad had the sugar free chocolate mousse cake, which surprisingly didn’t have any of that “sugar-free” aftertaste to it. Someone ordered the strawberry mousse. Delicious as well. Hmm…..what was this? 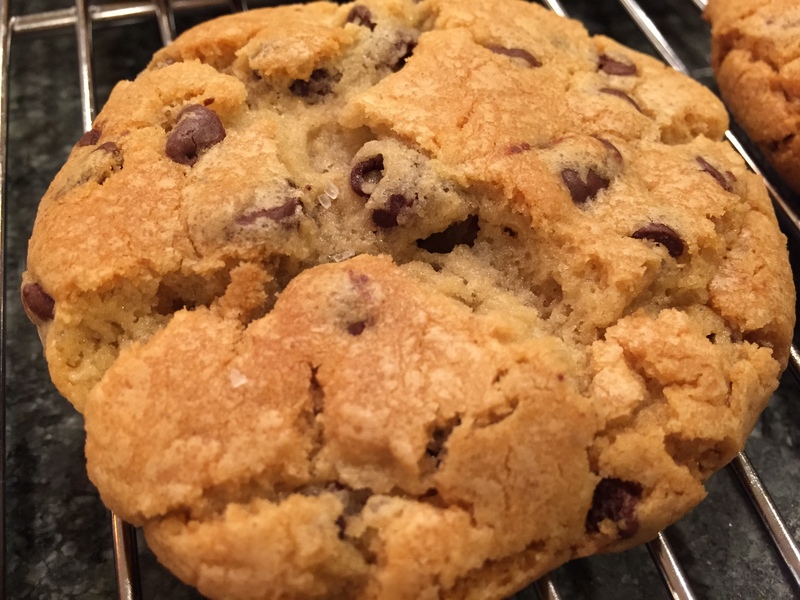 Well, it looks good and I can assure you we left no crumb behind. And then there was the sachertorte. No summer is complete without s’mores. 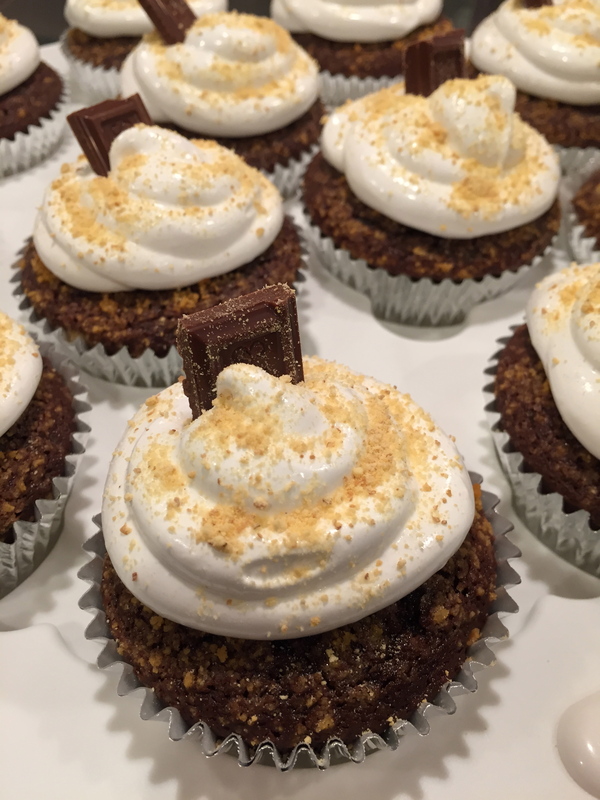 I actually don’t think I’ve had a proper s’more in quite some time, but these s’mores cupcakes are a great substitute. 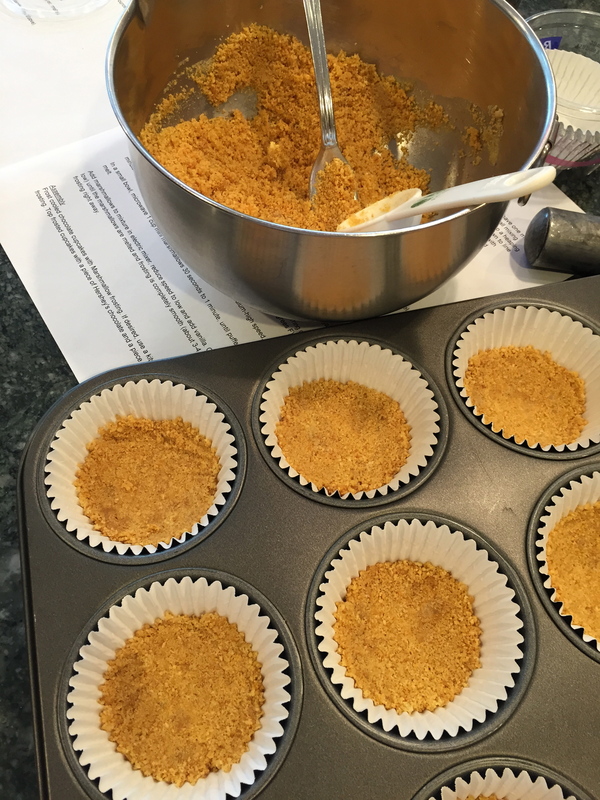 They began with a mix of graham cracker crumbs, sugar and melted butter that gets baked into the bottom of cupcake liners. Once the crust has cooled, the cake batter gets poured on top, and then some more graham cracker crumbs are sprinkled on top of the batter before baking. 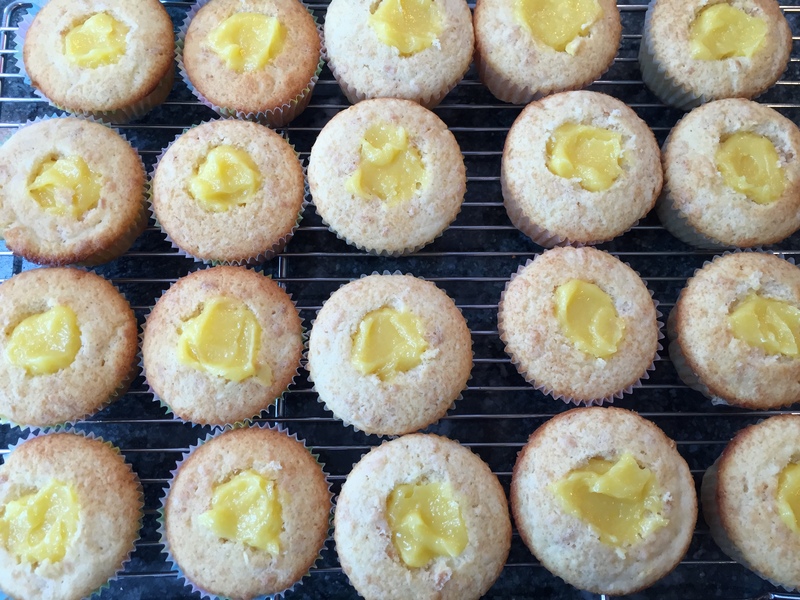 Once the cupcakes have cooled, it’s time to frost! 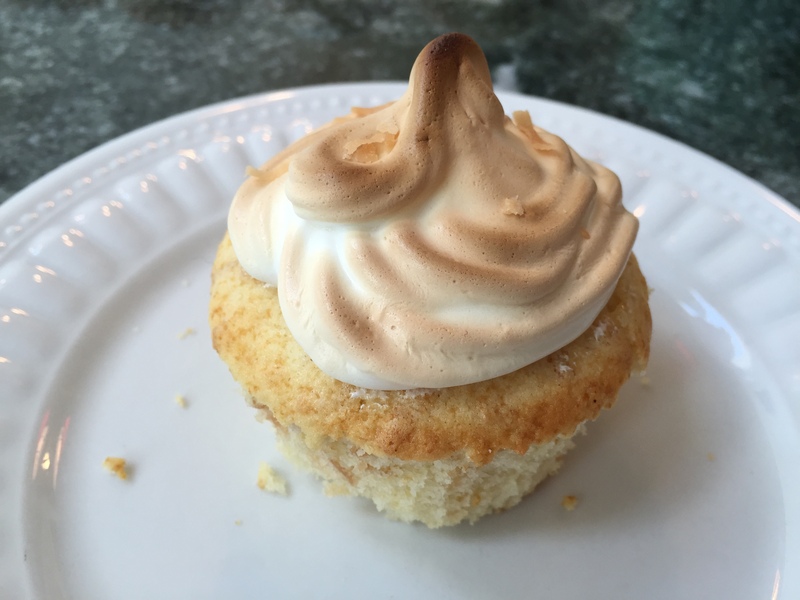 For this easy marshmallow frosting, all you need is four egg whites and a cup of sugar. Heat the egg whites and sugar with a double broiler just until the sugar has melted, then beat off the heat until peaks form. Decorating was the most fun. 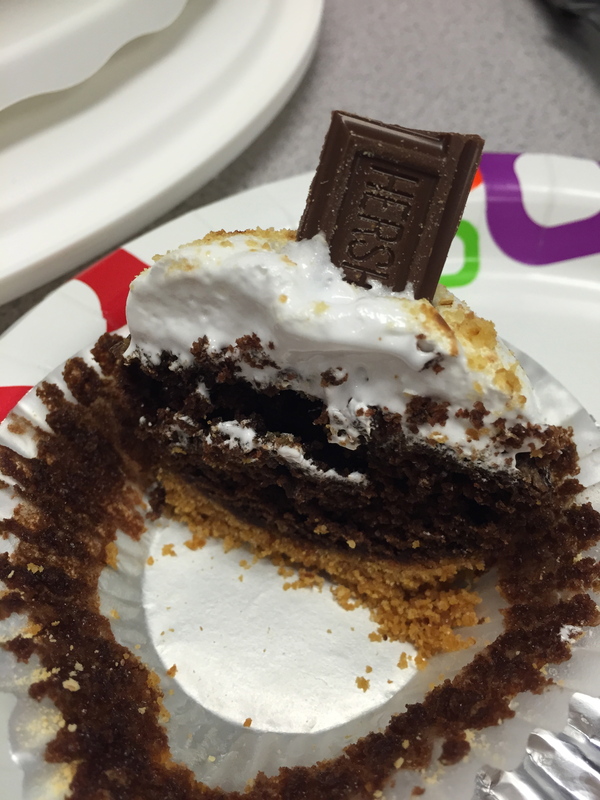 After piping the frosting, I sprinkled some more graham cracker crumbs for added texture and stuck a small Hershey bar on top. I was so pleased with how these came out, especially when I cut it down the center. Just look at the layers! I brought these to a work function, and the reviews were very good! These are definitely indulgent cupcakes, but they are so fun and summery! After we adventured through Ghent, Brussels and Bruges, we returned to Antwerp for our final Belgian destination. Our host, PJ, took us to a quiet but amazing restaurant that our other host, Hanne, described as the best restaurant in Antwerp. I really wish I remembered the name . . . The menu featured many decadent sounding dishes like roasted bone marrow, but we opted for the set menu of the day. 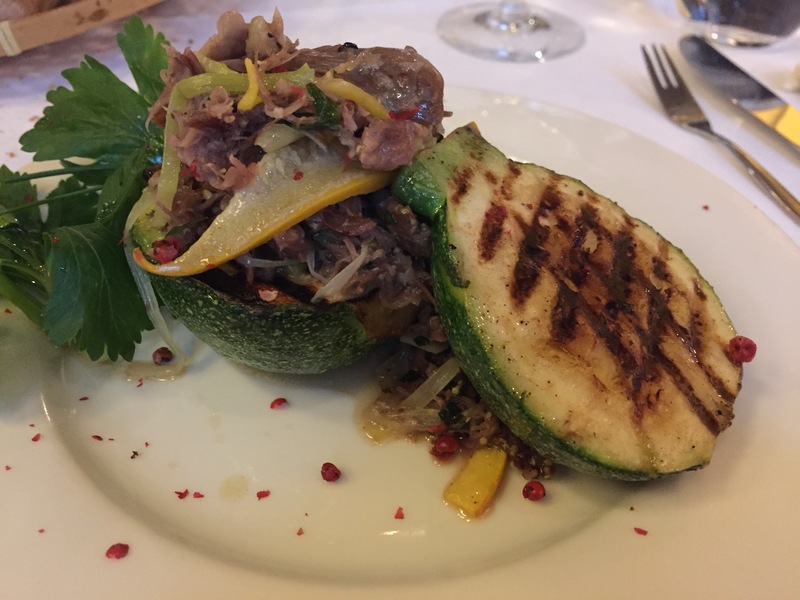 The first course was zucchini stuffed with duck. This was so good, I can barely even describe it. First, I was so enamored by the spherical zucchini. Also I love grilled zucchini, so I was already pretty excited by this dish. As for the duck, it reminded me of corned beef, both in taste and texture. The meat pulled apart with no resistance and just melted in your mouth. 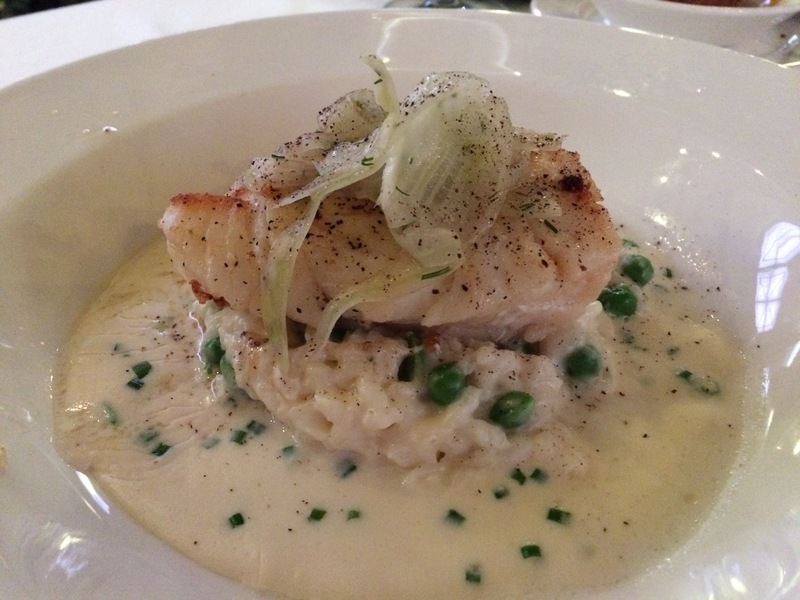 It was also flavored with pink peppercorns, which added a beautiful brightness to the dish. 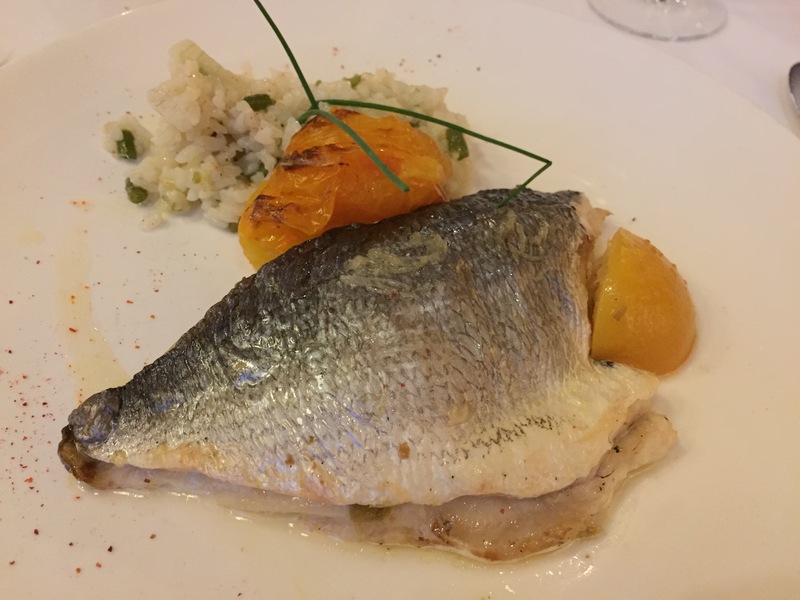 The second course was a white fish served with a roasted lemon quarter, a roasted yellow tomato, and a scoop of risotto. The fish was so moist and it tasted even more delicious when I spread the inside of the roasted lemon on it. The creamy risotto was a great complement, as was the yellow tomato as well. It seemed hard to believe that dessert could stand up to such a wonderful meal thus far, but the two desserts we selected definitely held their own. 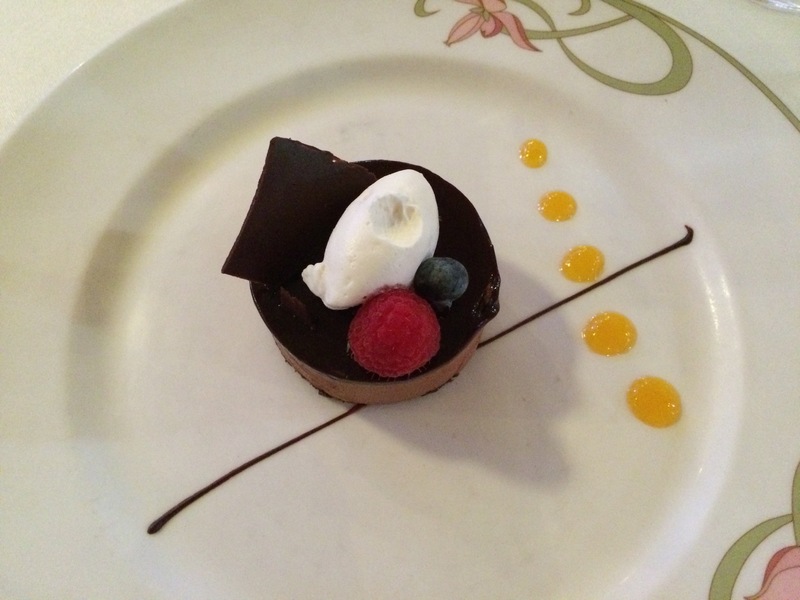 First, the chocolate mousse – decadent, rich chocolatey flavor, just the right level of sweetness . . . 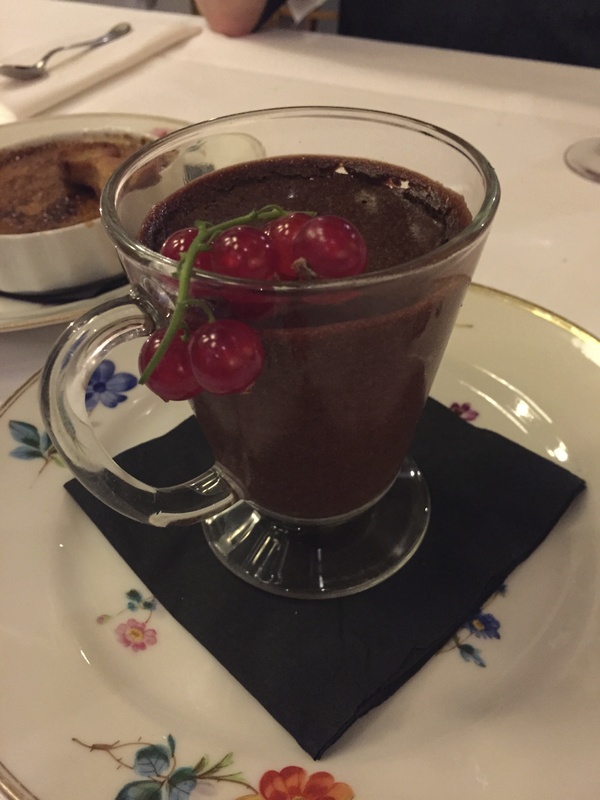 I think this may have been the most perfect chocolate mousse I’ve ever had, and that’s really saying something. 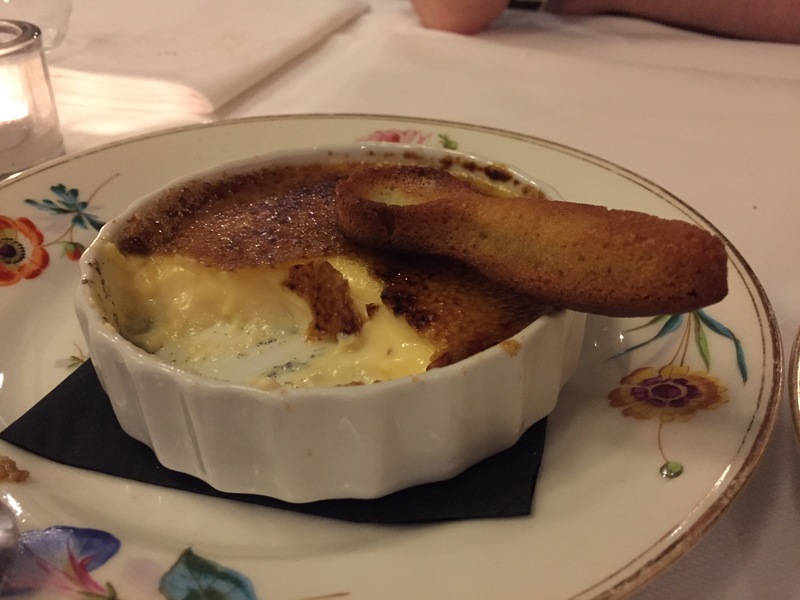 Second, vanilla creme brûlée with a cookie spoon. So delicious, but also so beautiful – just look at those vanilla seeds mixed in with the custard and topped with a perfect layer of caramelized sugar. Seriously, what a treat! This was an absolutely amazing meal, and we were so grateful to our hosts for introducing us to such a wonderful restaurant. Of course, an evening in Belgium must end with beer. 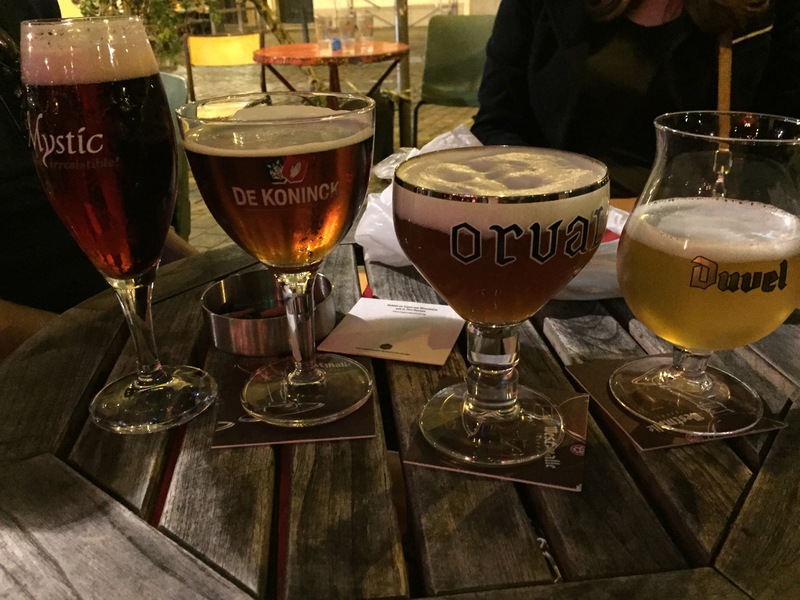 Our beer education continued with four more – Mystic, De Koninck, Orval and Duval. I probably wouldn’t say any of these were my favorite of the trip, but it was still fun to experiment with even more Belgian beers. French Fries . . . apparently they are not French at all! Despite the name, fries actually originated in Belgium, or at least that’s what all our Belgian friends told us. Also, it is also acceptable to have “frites” as your dinner in Belgium. Granted, no one is trying to claim this is at all a healthy dinner, but nevertheless there was a long line of people waiting for their frites dinner from a vendor on our second night in Brussels. 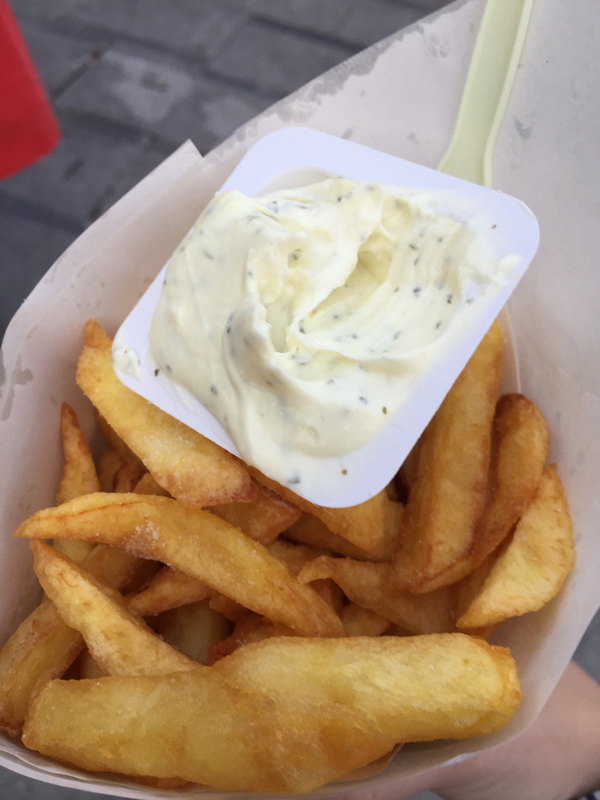 I am also a huge fan of the Belgian practice of eating mayonnaise with fries. Yes, ketchup is wonderful, but it’s also quite sweet. Mayo gives you a nice creamy dip for your delicious bites of fried goodness. I actually opted for tartar sauce with these fries because I like that extra tanginess. What better to wash down a meal of fries than a glass of Belgian beer. One of my favorite parts of my Belgian beer experience was that each beer has it’s own specific glass that it is meant to be drank from. Some say the taste of the beer is affected by the shape of the glass even. This one here is La Chouffe, which is described as “an unfiltered blond beer which is refermented both in the bottle and in barrels. It is pleasantly fruity, spiced with coriander and tinged with hops.” I was quite happy with it, and if only I had had a bigger purse this glass might have come home with me. 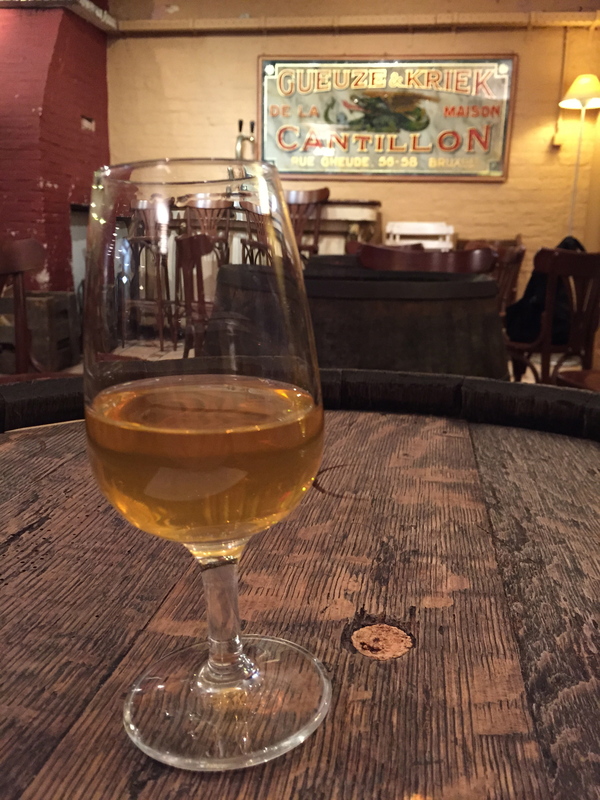 During the day in Brussels, we also visited Cantillon Brewery – a family-run brewery that began in 1900 and still continues to exist today. 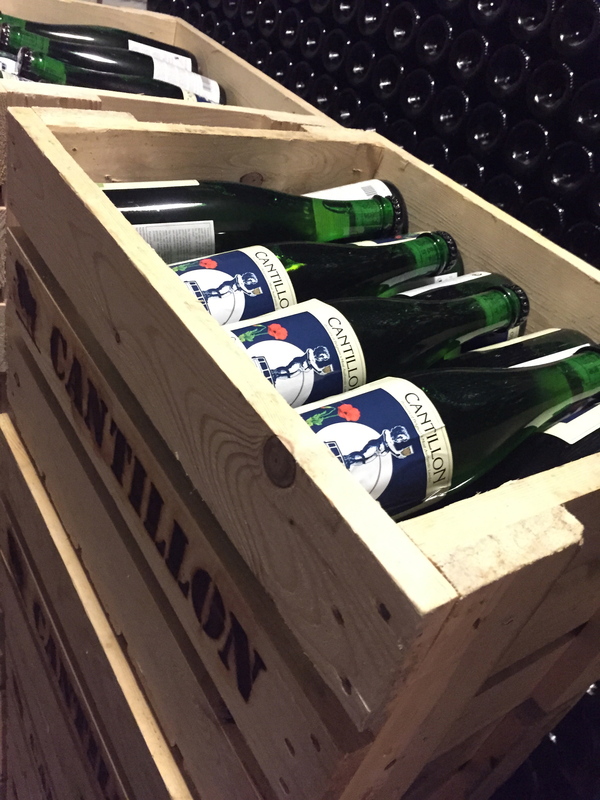 They only brew lambic beers, which are spontaneously fermented by wild yeast. Because they use open vats for fermentation, they can only brew in the winter when there are no bugs. As cool as it was to tour the brewery and appreciate the family history, we were not the biggest fans of the beer. Compared to most beers, the two lambic beers we sampled were not carbonated and tasted somewhere between wine and beer. Apparently, this beer is closer to what people use to drink in the old days, almost more than water. Although I may not choose to buy a lambic beer in the future, it was fun to try something new and have a new experience with beer and breweries. Of course, we had to have more waffles! 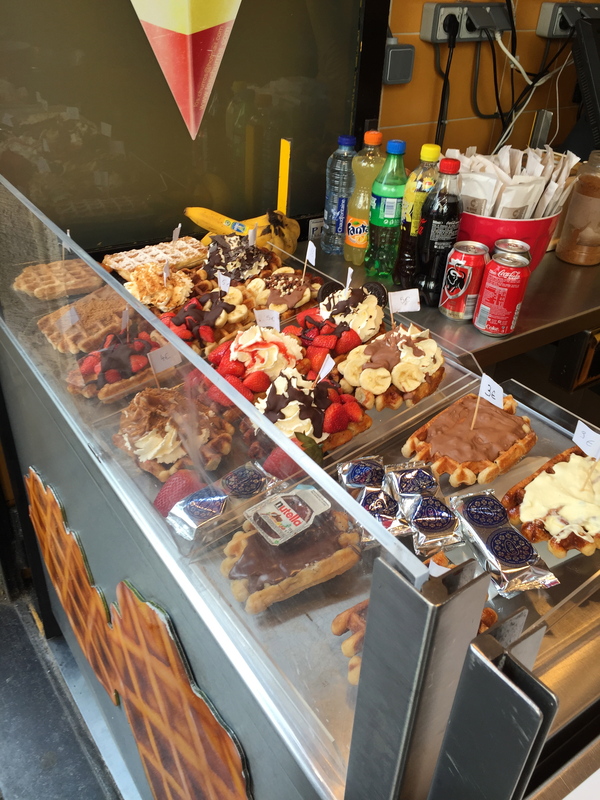 At most street vendors you find so many options for waffle toppings, including bananas, strawberries, nuts, cream, and of course chocolate and nutella. I opted for nutella, and boy did I get some nutella. Although I really want to say you can never have too much nutella . . . this may have just pushed the limit on that belief. 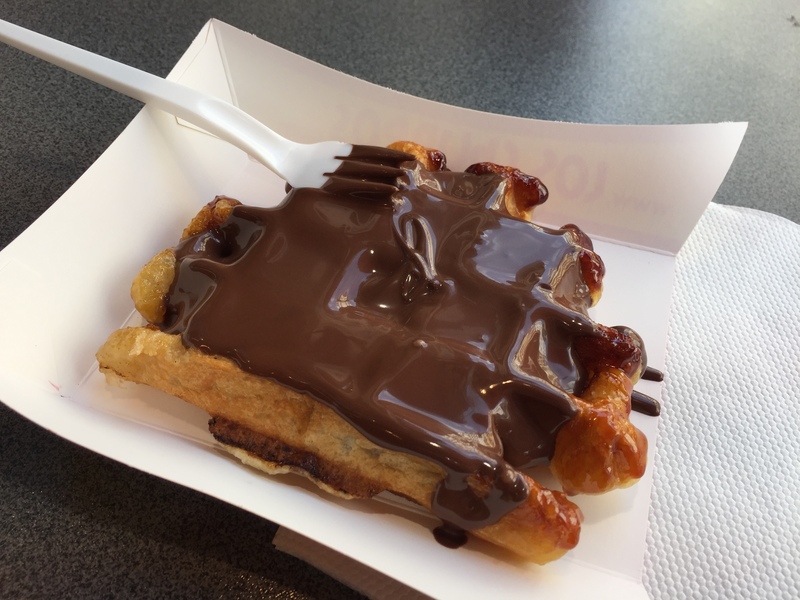 Regardless of the fact that my waffle almost drowned in delicious chocolate hazelnut spread, it was still so good – maybe almost sickly sweet too good – and yes, I ate it all. My eating experience got off to a very good start in Belgium. 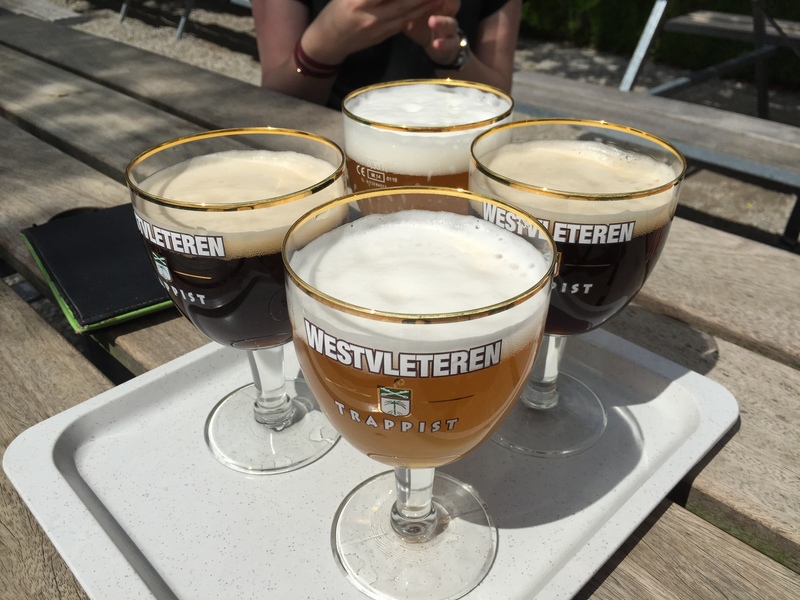 After leaving Paris, we drove to the Westvleteren Brewery. It was founded in 1838 at the Trappist Abbey of Saint Sixtus. They make three beers, one of which in particular has been acclaimed as the best beer in the world many times. I quite agree. We tried the blonde and the dark, and they were definitely my favorite beers of the whole trip. Also, I should note, you can only buy this beer at the Abbey, and if you want to take some home with you, there is a whole process involving calling ahead, giving your license plate number, and showing up with the correct car. 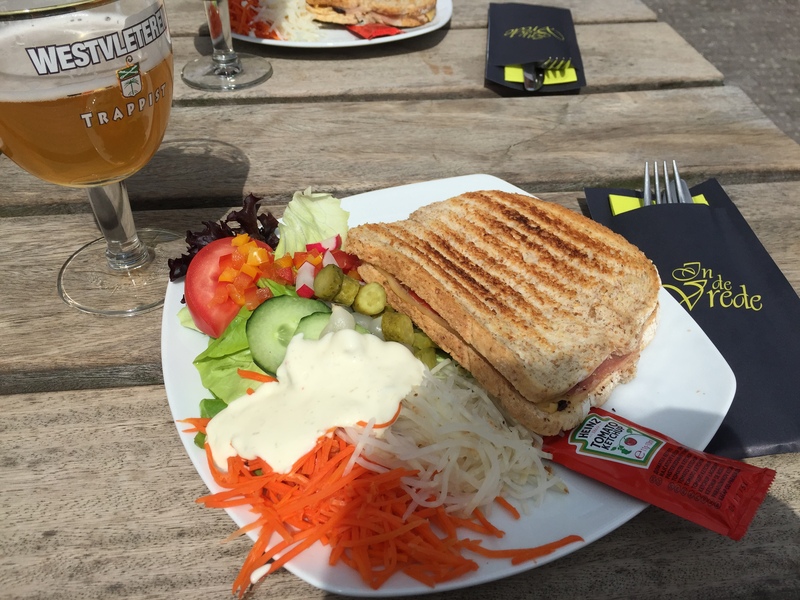 We also had some lunch at the bar – a croque monsieur with a lovely salad. I’d never had ketchup with a ham and cheese sandwich, but I actually quite liked it. Also, there were some herbs sprinkled inside the sandwich, which I will definitely try next time I make my own. Plus more of my favorite cornichon pickles! Our next stop was Ieper. In WWI, Ieper was a major location of trench warfare between the Germans and the Allied forces. Ieper was one of the first places where chemical warfare was used. Every night since 1928 at 8:00, there is the “Last Post” where there is a final salute to the fallen of WWI. Held in the huge monument inscribed with the names of the fallen, it was a very moving ceremony, even though it relates back to a time so long ago. Since we were staying a bit late in Ieper, we decided we should have a snack. 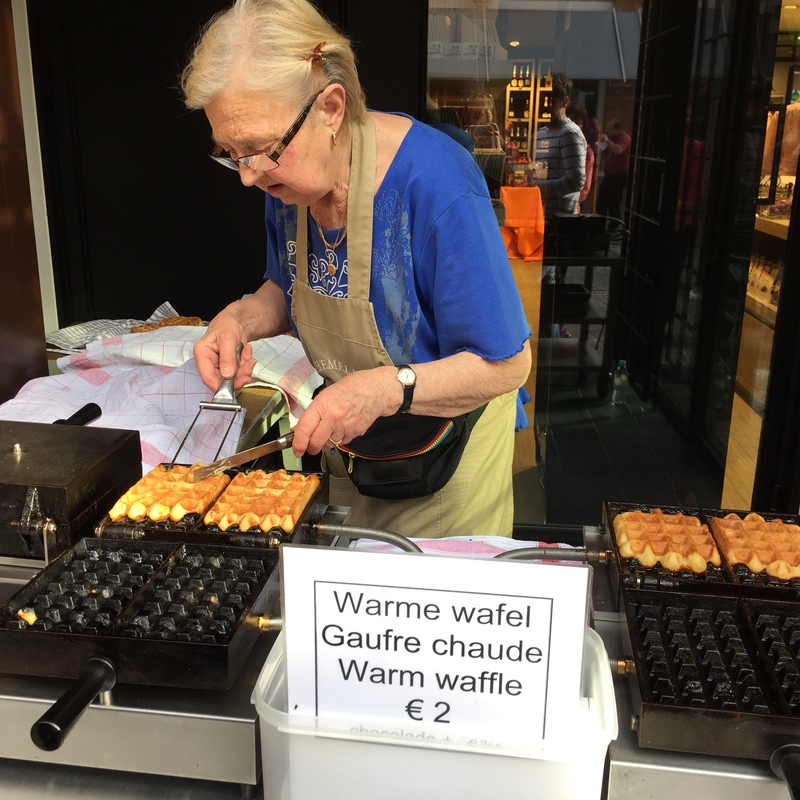 And so I give you – my first REAL BELGIAN WAFFLE. This was unlike any waffle I have ever had before. First, the pre-cooked dough was more sticky and firm like cinnamon-roll dough than the usual batter-like waffle mix of the States. The finally product was literally to die for. The edges were crunchy and caramelized, but the inside was soft, fluffy, and melted in your mouth. On top, we had a drizzle of Caillebotte chocolate, which apparently is supposed to be the best. 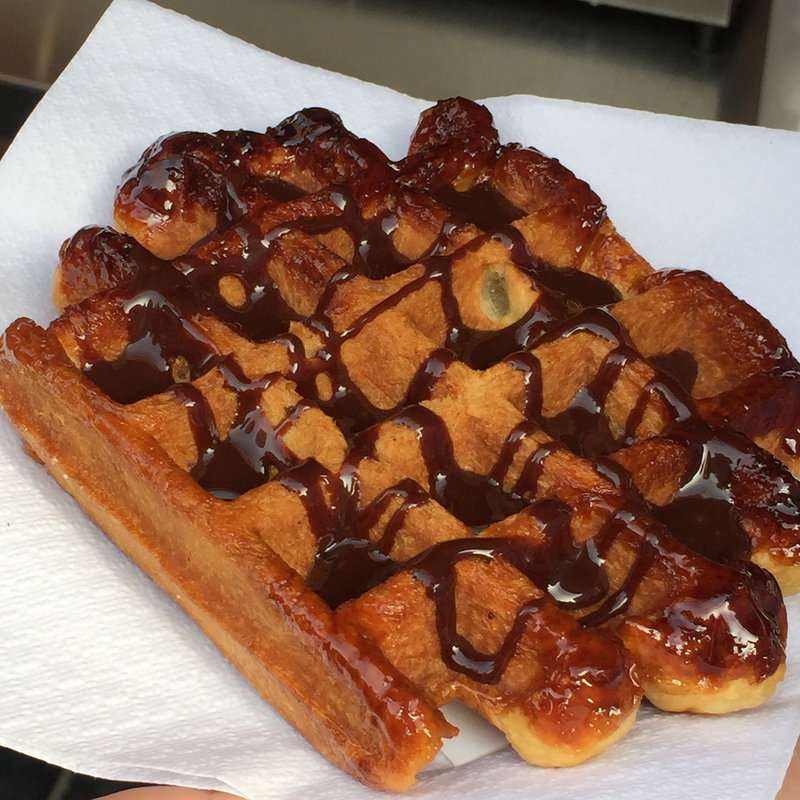 Sorry American “Belgian” waffles, but you are serious impostors and you just cannot compare to this glorious sugar treat. It may not have been fair to the rest of Belgium to start off with such good beer and food, but then again it was an amazing culinary welcome to a new country. If you can’t already tell, I LOVE Belgium!